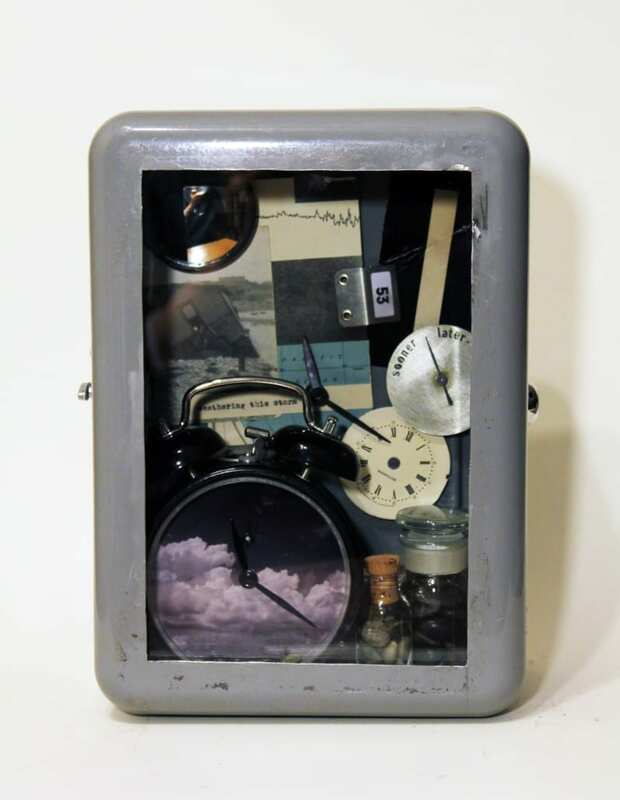 Originally presented as a temporary public art project in downtown Waterloo, Time Stops, the name for these micro-galleries, were found attached to wooden utility poles for people to discover as they walked through their neighbourhoods. Displayed together in the gallery, themes of climate change, time, and memory emerge as the Time Stops amuse us with their melodies. Reminiscent of cabinets of curiosity, flea market displays, shadowboxes, and surreal art, Time Stops invite people to step out of their thoughts and intended path to experience an intimately scaled poetic event. The altered chimes of a child’s music box accompany nostalgic images of floods and skies. By adding clocks, barometers, and other vintage curiosities, viewers are gently challenged to reconsider their place in a world of quickly changing climate. Paul Roorda is a Waterloo artist who transforms found materials to create two-dimensional art, sculptures, and outdoor site-specific installations that examine the relationship between religion, medicine, science, and environmentalism He has exhibited extensively with solo exhibitions in Canada, the United States, and Germany and has been awarded grants from the Ontario Arts Council and the Canada Council for the Arts. Paul Roorda was a finalist for the 2016 K.M. Hunter Artist Award in Ontario. He has also been the subject of an episode of “The Artist’s Life” which aired on Bravo TV in 2005. Roorda was Artist in Residence for the City of Kitchener, Ontario, in 2007 and at GlogauAIR in Berlin, in 2012 and 2015. His public interventions have been displayed in neighbourhoods in Kitchener/Waterloo, Toronto, and Ottawa. Recent art examines the human experience of climate change and the passage of time in slow moving kinetic sculptures and publicly installed musical micro-galleries. Read about the show’s history as public art, from first discovery in Waterloo neighbourhoods, to an order to remove the work, to the return of the art to the street, and finally to the work being stolen.